The Ryanair boss also took a pop at Boris Johnson. RYANAIR CHIEF EXECUTIVE Michael O’Leary has come out campaigning for Britain to remain in the European Union. The airline supremo spoke to journalists from a stage inside a hangar at Stansted airport earlier today. Behind him was a Ryanair plane emblazoned with the words ‘Stronger Safer & Better Off in Europe’. Politicians from the Conservatives, Labour and the LibDems followed O’Leary on stage with the UK’s Chancellor of the Exchequer George Osborne saying that an expected £1 billion investment from Ryanair would be “at risk” if the country left the EU. O’Leary, who has previously been a harsh critic of the EU’s aviation policies, told Sky News that the UK would be “absolutely crazy” to leave. He also took aim at Boris Johnson, the leading figure in the pro-Brexit camp. “With the greatest respect to Boris Johnson, he’s never run a sweetshop,” O’Leary said. They don’t actually create any jobs being Mayor of London, business people create jobs. We’re the ones that have to invest in more jobs. Ryanair here will create more than 500 jobs in the UK this year. You’d be absolutely crazy to leave the European Union. 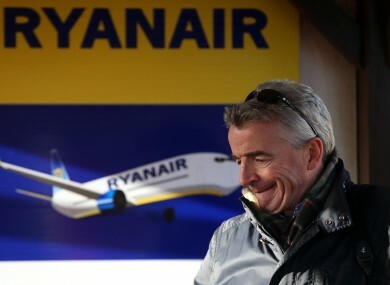 Ryanair’s bid to take over Aer Lingus was blocked by the European Commission in 2013 over competition concerns and O’Leary has previously described the European Commission as “the evil empire”. Email “He once called the EU an 'evil empire' but Michael O'Leary thinks Brexit would be 'absolutely crazy'”. Feedback on “He once called the EU an 'evil empire' but Michael O'Leary thinks Brexit would be 'absolutely crazy'”.